Each year the various graduate shows scattered throughout the calendar and country remind us all that there is so much young talent out there in the UK. For us, there is little better than discovering it before watching it develop with us. However, despite our ever present eagerness a few talents are missed. Now, Central Saint Martins' MA graduate show is undoubtedly one of the most exciting places to discover the fashion stars of the future but this years crop passed me by. Months have passed since the show and I've only just stumbled across the obvious talent of Christopher O'Brien thanks to the designer's pro activeness and a keen buy from LN-CC. 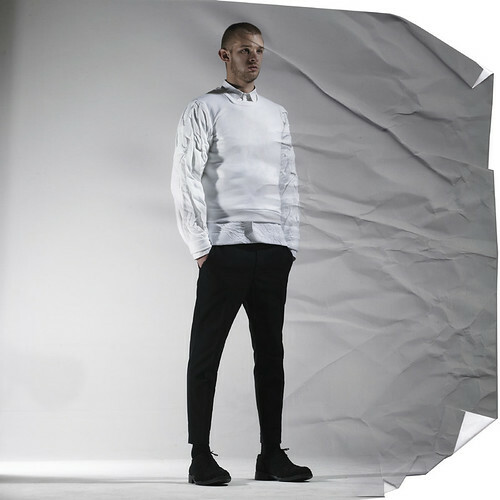 O'Brien's crinkled, minimal wardrobe of well tailored staples might have slipped past my blogging radar but it certainly caught the trained retail eye of John Skelton who duly bought the collection for his forward thinking store. 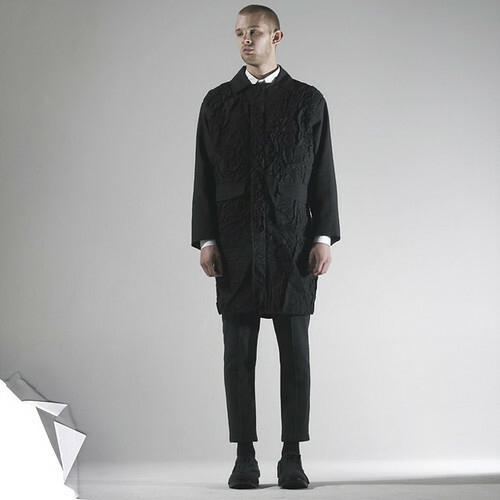 As well as working as a freelance stylist and costume designer during his studies at Central Saint Martins, O’Brien honed his skills with placements at Jonathan Saunders, Jens Laugesen and E. Tautz. That's quite the education and the fruits of these experiences and influences can be seen in his accomplished MA graduate collection. 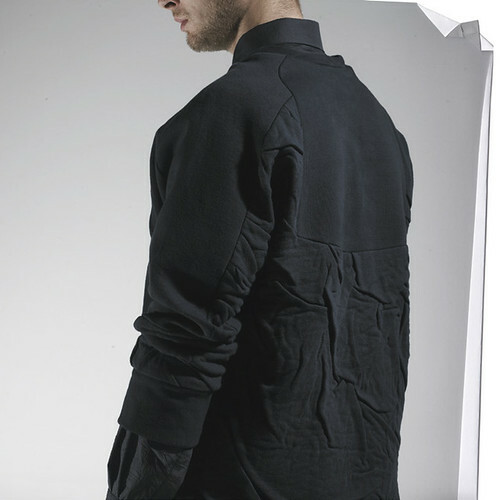 At its wrinkled heart the abstraction of the male silhouette through the manipulation of fabric and layering in a distinctive yet restrained manner. The use of distressed and crinkled fabrics throughout his accomplished graduate collection creates individual subtleties and sense of life. 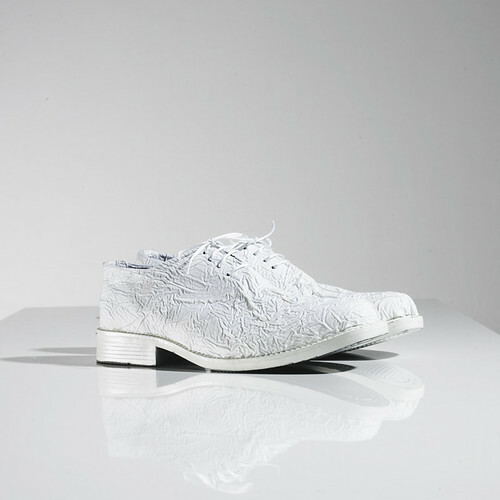 I'm instantly reminded of the collection that saw Christopher Bailey emerge as one of the best menswear designers of his generation, Burberry's Cumpled Classics collection for SS09. 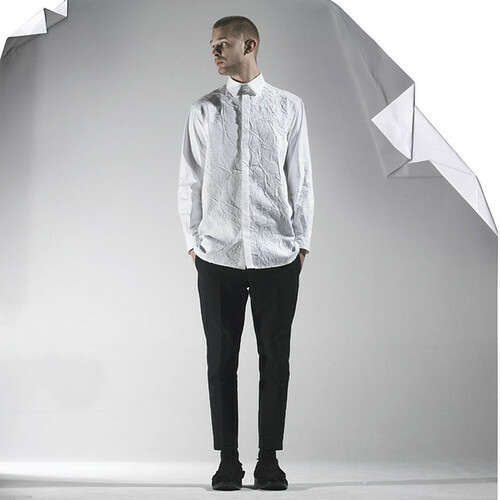 However, here the real spirit of the collection is grounded in ideals of minimalist menswear and traditional tailoring but O'Brien develops the theme by exploring the creative potential of inherited shapes and textures. Before we take a look at the collection itself, we had to sit down with the designer to learn more about his work and his hopes for the future. SS: What were your inspirations, your dreams and the driving catalyst for launching Christopher O'Brien? 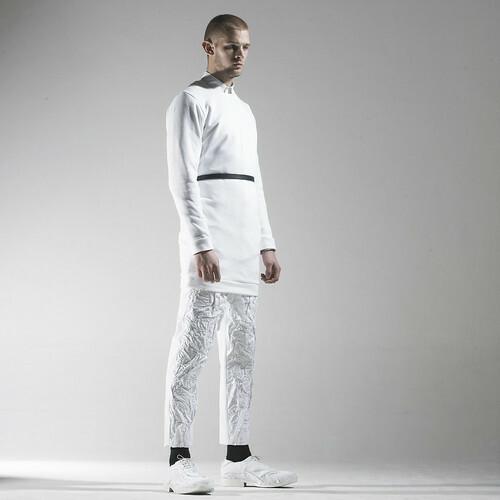 Christopher O'Brien: I think there are a few reasons for starting Christopher O'Brien, chance being a big factor in that John Skelton saw my look book and decided to stock my collection. I also think that my drive comes form proving certain people wrong that told me I wouldn't do it. My inspirations and reason for Christopher O'Brien is to hopefully gain recognition within the industry and for people to like what I do. SS: Aside from it being your name, what does Christopher O'Brien mean to you? Christopher O'Brien: I'm not to precious about myself, I am lucky enough to enjoy my career and hope that Christopher O'Brien develops into something natural and easy for people to connect with. SS: Describe the moment you realized you wanted to be a menswear designer? Christopher O'Brien: I started out as a womenswear designer and always had a very androgynous style that I felt would suit men. It was while I was working for Jens Laugesen that I decided I would be a lot more comfortable if I transferred to menswear so I applied the the MA to help me build a portfolio. SS: While studying for your MA in menswear design, you worked as an intern for large periods of time for Jonathan Saunders and Giorgio Armani. More recently, you worked for design advisor firm Jens Laugesen and as you were about to graduate, you worked for E. Tautz who duly offered you a designing position. What did these experiences teach you? How did these experience shape you as a designer? Christopher O'Brien: I think that internships are a very important part to your education, I learnt more at Jonathan's in my spell there than probably my whole BA, it is reality and shows you how the industry really works. I wasn't actually going to go to my interview at Jens because I thought I had bagged a job at Jil Sander but it was probably the best career move I ever made as Jil fell through and I think I learnt so much more working in close proximity to him than I ever would in a big company. He was a very demanding boss but helped me to develop my design process more than anyone, we constantly worked on different projects. I think he is a true designer in the sense that every project we did was integral and stuck to a concept. In terms of how these experiences have shaped me, I think they taught me a pretty good work ethic, and just to try things, if they don't work, move on and don't worry. SS: In your eponymous debut collection, you take a progressive stance on conventions of layering and minimalism, and draws on influences from art to sportswear to photography. Can you talk us through the inspiration for the collection? 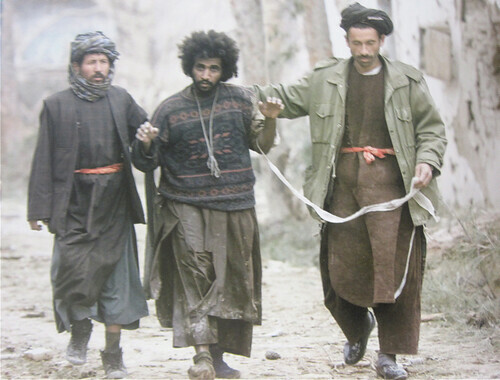 Christopher O'Brien: The main point of inspiration was a photo of some refugees in the paper, I just really liked the different layers they were wearing and it made me think about the way we wear clothes. When we put a jacket or coat on it often crinkles the garment under and I just wanted to look at bringing that effect to the top layer where you wouldn't expect it. I took it pretty extreme but as it was my MA collection with no restraints I figured it was a good time to push notions of what a man would wear. 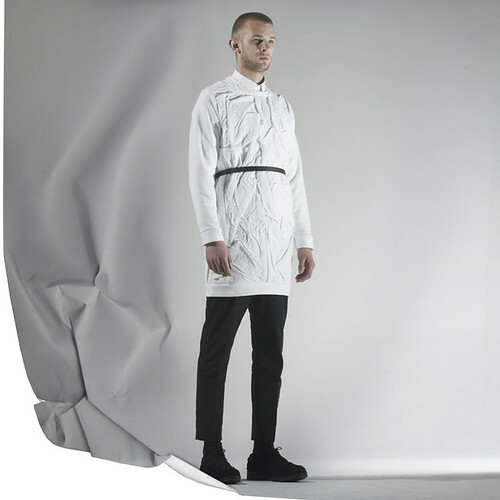 Christopher O'Brien: The collection has at its heart the abstraction of the male silhouette through the manipulation of fabric and layering in a distinctive yet restrained manner. The use of distressed and crinkled fabrics throughout each design creates individual subtleties and elements of awkwardness, which at first glance are not immediately apparent. 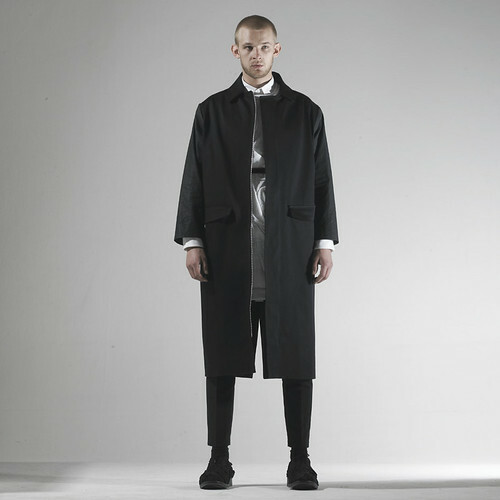 Whilst the spirit of the collection is in tune with ideas of minimalist menswear and traditional tailoring, albeit in a disassociated way, it develops its theme by amalgamating these conventions with styles drawn from elsewhere. SS: Were you taken aback by LN-CC's interest in the collection? Christopher O'Brien: I really like the guys at LN-CC and like the whole concept to the shop, I think they push boundaries with what they stock and don't want to be like any other shop which gives opportunities to designers like me. I'm happy it happened so hopefully it will go well. SS: What excites you about the future of menswear? Christopher O'Brien: Being involved in some kind of capacity. A scan of the image that sparked O'Brien's collection. Despite my obvious support for exciting graduate talent, it is extremely rare that I encounter a collection that could easily slip in to my everyday wear. 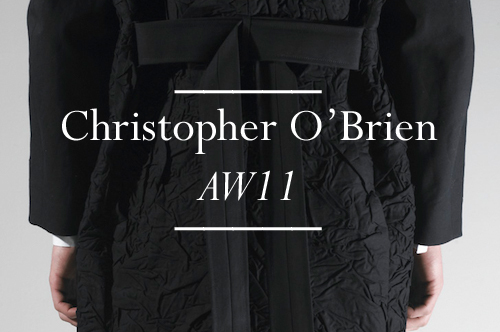 I'd happily add Christopher O'Brien to my wardrobe and it should come as no surprise that a number of pieces have already sold out over on LN-CC. I'm sure we will be hearing the name Christopher O'Brien a great deal in the coming seasons and beyond. I have a couple of Christopher O'Brien pieces, he certainly has bags of promise and potential. Great insight into his work, the Francis Bacon link was especially interesting. I am soooo excited by this post!!!!!! "keen buy from LN-CC" - If only there were both more buyers like John Skelton of LN-CC, and more consumers willing to support to the talent and ideas of new designers. Especially one's as marvelous as Mr O'Brien! 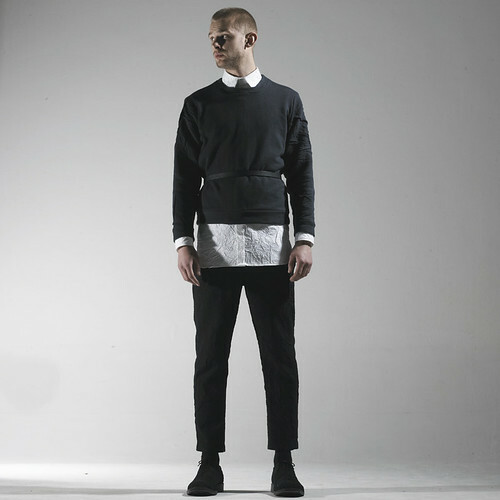 "I started out as a womenswear designer and always had a very androgynous style that I felt would suit men." - Clearly there was a good reason for me to be so excited here. "I learnt more at Jonathan's in my spell there than probably my whole BA" - One of the main reasons why I think people who want to design should go to school for anything but. I absolutely am in love with the crinkled texture of the textiles. However I am more then a little confused as to 1. how he goes about creating the textile and 2. how it will stay after the first cleaning. Unless it's something like Pleats Please where everything has been heat-pressed into polyester but it looks like these are mostly natural fabrics here? Did I miss something? "no surprise that a number of pieces have already sold out" - I would loooove to know the demographic of the LN-CC consumer. Where they're from and what they do. I truly want to meet the new high-design/end consumer of our generation, especially in these troubling economic times. Steve, your journalism is next to none and I hope you don't think I stopped reading because I have sooooo many posts to get through.